Armand Dufaux is born in Paris on the 13th of January 1883, his brother Henri on the 18th of September 1879 in Chens sur Léman (F). As a young man, Henri studies arts while Armand prefers mechanics. From 1898, they will both work and create a light engine for bicycles and take out a patent for this invention. They will produce and sell their engine under the name of Motosacoche. Theirs fifth factory located in Torino will produce up to 50 motor-cycles per day in 1908. The two brothers starts in 1902 the first studies for a flying machine capable to lift off either vertically as an helicoptere or horizontally as an aircraft. It is a very ambitious project knowing at that time neither helicoptere nor aircraft have flown. They work on this project during seven years, testing the concept with kites, propellers and aircraft models. In april 1905 they present an helicoptere model to the public in Geneva, unfortunately nobody will realize how advanced their concept is. 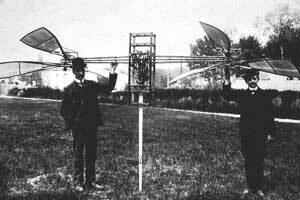 In May 1905, they present the same model in Paris for the Aero Club from France and receive a well deserved recognition and take out a patent for this convertible flying machine with tilted rotor. In 1906, the Dufaux brother decide its time to try their concept on a real size aircraft, they draw plan of a 120 horsepower engine and finish in August 1908 to built the first flying machine "capable" to fly horizontaly and vertically. Their Tiltrotor measures 9 meters in lengh and weight 660 kilos… It will never lift off. Realizing that the available technologie is unsufficient, they abandon their dream of vertical lift. 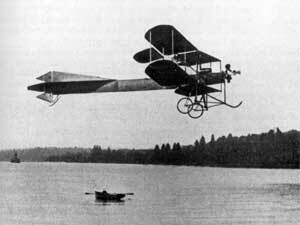 In 1909, the Dufaux brother start the construction of a biplan, the Dufaux 4. In December they carry on the first take off trial in Viry (F), they are successful on the 16th, the biplan lifts off and rise to an height of around two meters. The next morning, Henry "breaks wood" crashing from 15 meters height and almost killing himself. The brother also open their own factory in Geneva to built and repair propeller and in 1910 to built a small serie of five biplans. In july 1910, Armand will fly 31 minutes in 18 circuits at Viry, a record flight. In May 1911, Ernest Failloubaz buys the licence to built in Switzerland the Dufaux biplans. Out of the 15 airplanes built between Carouge and Avenches, only one survived and is diaplayed today in the transport museum of Luzern. By the end of 1911, the brothers definitely stop their activities in aviation. Henry and Armand had never obtained their pilot’s licence. Since 1912 Armand lives in Paris and works in the auto industry, he returns to Geneva in 1939 and will pass away on the 17th of July 1941 at age 58. Henri Dufaux returns to painting, a family tradition, he moves to Paris, travels a lot and receives several honours. He passes away on the 25th of December 1980 at age 102.